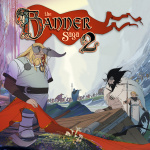 The Banner Saga trilogy is almost as epic as the development of the games themselves, from starting out as a Kickstarter campaign six years ago to the series concluding with the release of The Banner Saga 3 at the end of July. 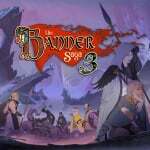 With an interesting combination of multiple characters, detailed narratives and tactical role-playing, The Banner Saga 3 looks set to both surprise and satisfy fans and newcomers alike. 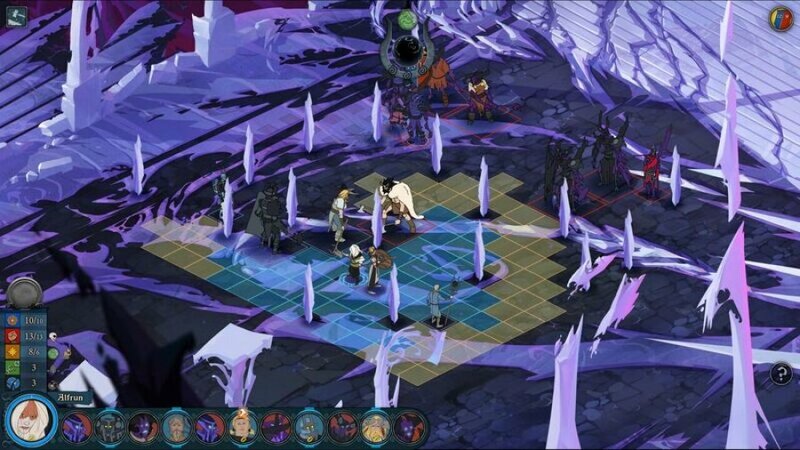 We spoke to Arnie Jorgensen, creative director at Stoic about the series. Nintendo Life: Let’s go all the way back to the launch of the Kickstarter in March 2012 and the project's incredible following. Was there ever a time when you were nervous about how well it would do? Arnie Jorgensen: Oh yeah, more as we got closer to launch though. In the beginning, I wasn’t so nervous because we had completed the proof-of-concept for the Kickstarter video, so I pretty much knew what we were trying to do and felt good about it. Closer to launch, I was just concerned that perhaps we weren’t delivering on what people's preconceived notions about the game were, even though that’s kind of out of our hands. The largest problem was deploying seven times more money than we planned into the game. It got tricky. It takes longer to build a game that is seven times larger. How has the pressure changed over the course of the last six years, since the introduction of this world and these characters, following up with a sequel and now the conclusion of the trilogy? This is a tough one to answer. As I think on it I just now realize launching these games are a bit like giving birth in that there’s a lot of pain in the delivery, but once you see the baby you tend to forget all the hardship (or so I’ve heard). I’m sitting here thinking that I don’t feel much pressure right now, but it’s because we just finished. There’s almost a sense of euphoria. We set out to do a thing, a pretty big thing for a small team, and we managed to pull it off against the odds. It’s a very gratifying feeling. Each game had its own immense, high level of pressure involved with finishing it, and each for different reasons. Saga 1 was done by a very small team with something to prove. Saga 2 was us wondering if we could keep the community engaged and bring them into the final game with us. Saga 3 had some of the workload pressure off as we added to our team, but then that brings managerial pressures as well. Long story short, don’t get into game development if you're pressure-averse. How was the development of the trilogy handled in terms of narrative? Alex Thomas had the whole story arch basically planned out. We knew where we wanted to go with the entire thing, but the way we got there took many twists and turns. Alex left after Saga 1 and Drew McGee took over the writing chores of Saga 2 and did a great job writing with the same voice to keep it consistent - not an easy thing to do. He kept with the same narrative beats we had planned for which put Alex, who returned to the team, in a great place to finish Saga 3 the way we’d always planned. How has the overarching story progressed during the development of the three games? We actually changed course completely on the original idea for where the story went in Saga 3, and it took us seven months of development to realize it simply wasn’t working. We scrapped the entire thing, Alex returned, and we started again in the original direction. Once we did that, it all fell into place and now ends the way we know it should. Is this the last we will see of these characters and this universe? I certainly hope not! That being said, it’s really up to the players and community. Do they want more? We’d love to provide lots more as long as we can make a living doing so. We’ll just have to see how the trilogy is received when it’s complete. How long after the events of part two does the third game take place? A couple of days. The story picks up right where the last game left off. When Saga 3 launches and the trilogy is complete it should feel like one long game. Do the choices we’ve made in the second game carry over? What can we expect in terms of new characters or locations? We’ve got well over 40 characters by the end of Saga 3, so we were careful to only add characters that were meaningful to the story (maybe sometimes they’re just great in combat). One of my favourite characters, Alfrun, debuts in Saga 3. She’s a mender of sorts, but the other menders call her a witch. As far as locations, players will see a lot of Arberrang and also travel into the darkness, which was a lot of fun to work on because it’s so different than anything else we’ve done in the series. Do you feel like the stakes are the highest as it’s the final instalment? Definitely! The end has come. Every beloved hero can die, no one is safe now. That being said, the player can also keep most of them alive. All of creation can be undone, or… kept alive. We worked hard to make the player feel like their end to their saga really feels unique to their playthrough. Their choices must count or what was it all for? Are there harder choices or more severe consequences? It’s hard to say if there are “harder” choices. Sometimes the choices in this game that got me the most seemed trivial, but they were emotional to me. We certainly worked to make the choices just as hard though and yes, the consequences are a lot more severe. We don’t need to continue any story after this, so decisions can quite literally end the world in this one. Has the system changed technically this time around? Just like we added systems to Saga 2 from Saga 1, we’ve added more in Saga 3 than we had in Saga 2, but it should all feel like one long game. That’s been the stated goal from the beginning. When we add systems we do it through the story so it makes sense in the context of the world. It feels like a ramp up rather than a hitch. How have you balanced adding new story elements while still having to conclude the trilogy? In many ways, we’re closing off story elements here. There are so many loose ends to tie up and we didn’t want it to feel rushed, so when we add a new story thread it’s because it needed it organically to add power and emotion to a story the player brought in from a previous game. Some players may find that some things are left unsaid. Sometimes the players will think they made the worst mistake in the world only to find, in the end, it was a wonderful decision. Has the design of the battle system changed from the previous games at all? We’ve added a new ‘battle waves system’ into the game. It turns on its head the current way to do well in combat which is to hurt, but not kill enemies. With the battle waves system, the combat is on a turn timer, if the player doesn’t defeat the enemies on the board in a certain number of turns then more show up making it very difficult. So the player now has to make more tactical decisions than they had to previously. We’ve also added Heroic Titles that players can give to heroes of a high rank. A Heroic Title can make a hero far more powerful than they used to be, but this is needed as the enemies are also very powerful in the darkness. Have you experimented with any aspects regarding specific conditions within a battle or obstacles within the environments? We’ve got more handcrafted battles in this game with different win conditions rather than ‘kill them all’. We’ve also added different kinds of obstacles that are interactive to change things up. What can you tell us about the POV characters in the third instalment and the impact on the story? 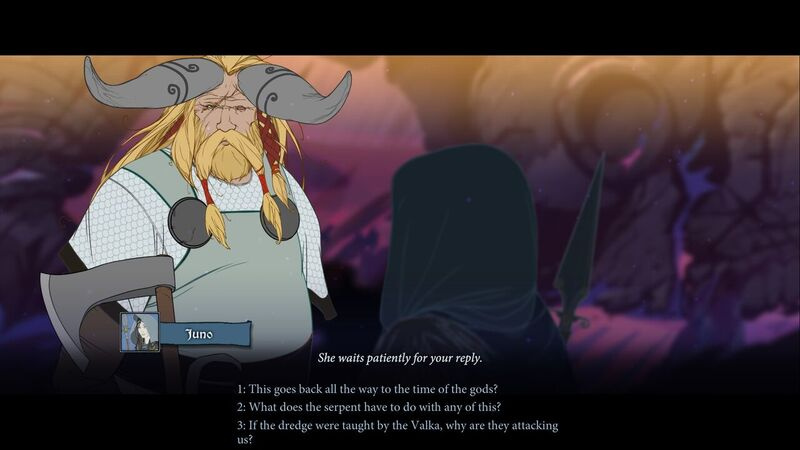 No one is safe in Banner Saga 3. Iver will finally get the spotlight put on him. Father and daughter pine for each other, for some players that may be resolved. Who should take up a banner if the bearer falls? [There are] many diverse outcomes for the POV characters. Are there any main themes in the third game you wanted to convey? Even though the story was sussed out years ago it’s interesting to see that it’s very topical to what we see in the world right now. Some will think we’re tracking what’s going on with current events and some will understand it for what it is, a timeless story about love, devotion and sacrifice. 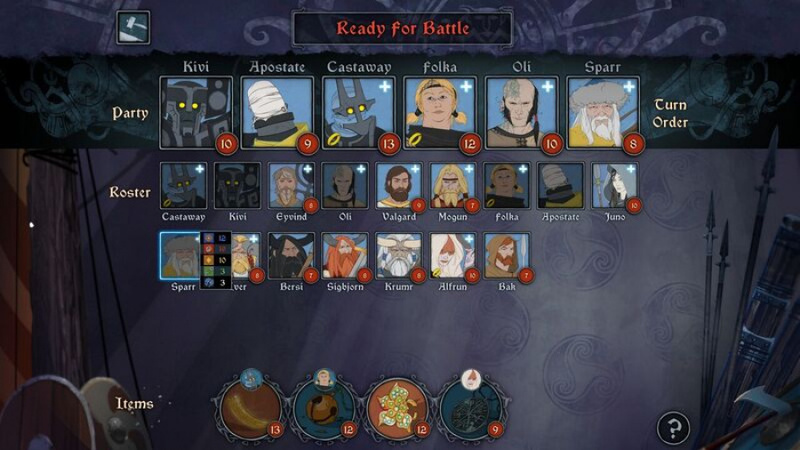 For those playing the games for the first time, would you say the Banner Saga is a different experience when played as a whole, rather than split into three parts? 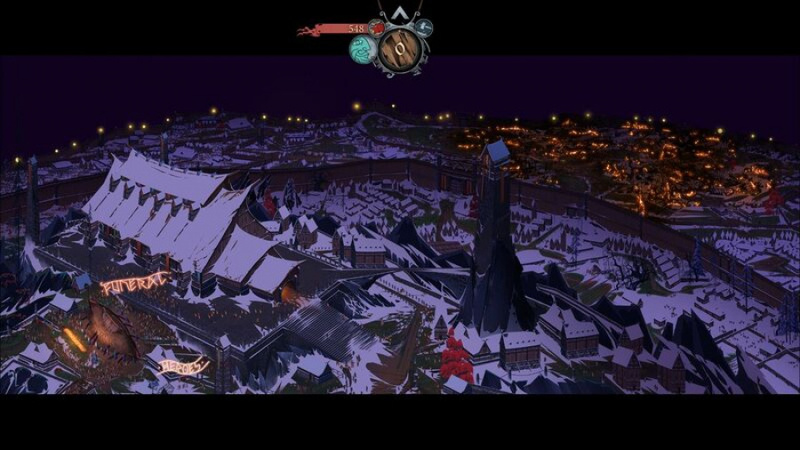 Banner Saga is most definitely a more full experience when played as a whole. It won’t be understood as well if the person comes into the story in chapter 3 without playing 1 and 2 first and we’re really not trying to slow down for new players. We throw them into the deep end here. Kinda rough for me to say that as it may dissuade some from buying Saga 3 (like they should! ), but it is what it is. It should be played as a trilogy. If people are like me though, they’ll wait for the conclusion to binge on all three without having to wait between. Saga 3 will soon be out, so just get the whole trilogy and have at it! Are you excited about generating a new influx of fans on Switch? The Switch is an absolute blast, we’re really excited to be on it. The Switch community has lots of energy as well so we’re getting great and positive feedback from them. 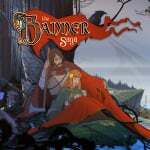 My kids love Switch and haven’t yet played Banner Saga. The other morning I downloaded both Saga 1 & 2 and then secretly loaded up the front screen for them to see. They couldn’t believe their eyes when they looked, and there before them wasn’t Mario Kart. They switched back over and raced on. Is there a crying emoji I can use here? We’re already moving on ideas for the next game which will be, you guessed it, a Tactical RPG. We can’t get enough and love what we do. We would like to thank Arnie for his time. Some comments by small company developers usually make me think. How many copies do you usually have to sell to pay your costs? How can one affirm that a game is commercially successful? I know these questions all have answers stating with "it depends on..."
1) investment - "The largest problem was deploying seven times more money than we planned into the game"
2) are people gonna like it? - "I was just concerned that perhaps we weren’t delivering on what people's preconceived notions about the game were, even though that’s kind of out of our hands." 3) Can I support myself and my family if I dedicate to this solely? - "We’d love to provide lots more as long as we can make a living doing so"
I was gonna buy but the file sizes kept me from doing so. Plus I saw the trilogy release on other platforms and figured it would come to Switch. I've really enjoyed this game. Perfect on Switch! I played about an hour off the first and struggled with it. At some point i will try again. Love the art style of these games. Reminds me of the animated "Hobbit," or "The Last Unicorn." I might pick them up, even though I am daunted by the emotional toll they will undoubtedly take upon me when my characters permadie. This is cool. Unfortunately a game that you transfer over the data from game to game. So I'll need to finish it where I started.